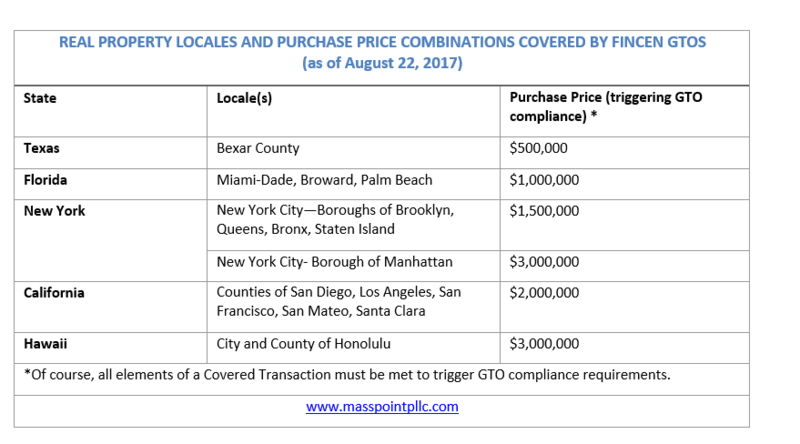 On August 22, 2017, the Financial Crimes Enforcement Network (FinCEN) issued revised Geographic Targeting Orders (GTOs) designed to combat money laundering and related financial crimes in select U.S. residential real estate markets. The GTOs further expand the scope of GTOs issued in January 2016, expanded in July 2016, and renewed in February 2017. In tandem with the August GTOs, FinCEN issued an Advisory to Financial Institutions and Real Estate Firms and Professionals (the “Advisory”) and FAQs. In the Advisory, FinCEN explains that luxury real estate markets are “vulnerable to penetration by foreign and domestic criminal organizations and corrupt actors, especially those misusing otherwise legitimate limited liability companies or other legal entities to shield their identities.”[i] FinCEN is not alone in its concern about beneficial ownership opacity generally and in the context of real estate transactions. Given the high level and widespread nature of scrutiny of illicit activity in luxury real estate markets, it seems reasonable to expect FinCEN to, at minimum, continue to employ and expand GTOs in the foreseeable future. The remainder of this Business Update discusses core mechanics of the August GTO. Reporting and Records Retention. The GTOs impose reporting and records retention obligations on TICs, specifically the: (1) e-filing within 30 days of a Covered Transaction of a FinCEN Form 8300 through the Bank Secrecy Act E-filing system and (2) retention of “all records relating to compliance” with the GTOs for five years from the last effective date of the GTO (including renewal periods). FinCEN Form 8300 Information Gathering and Reporting. An e-filed FinCen Form 8300 must include the following information. Legal Entity Purchaser. The name, DBA (doing business as name), address, taxpayer or employer identification number, and additional information about the legal entity purchaser is required. Because indirect ownership is included, in cases where the legal entity owner is owned by one or more legal entities (directly or indirectly), a Covered Person will be required to search up the chain of ownership until natural persons meeting Beneficial Owner criteria are found. Where ownership structures are multi-layered or otherwise complex, the search for Beneficial Owners can be costly, administratively burdensome and, in some cases, raise red flags that might require further due diligence or weighing of potential risk. Covered Transactions—i.e., those subject to the information gathering, reporting, and records retention requirements of the GTO—are all cash residential real estate purchases, for specific minimum amounts and in specific locales, by legal entities such as limited liability companies, partnerships, corporations, and other business entities formed under the laws of a U.S. or non-U.S. jurisdiction. Addition of City and County of Honolulu. 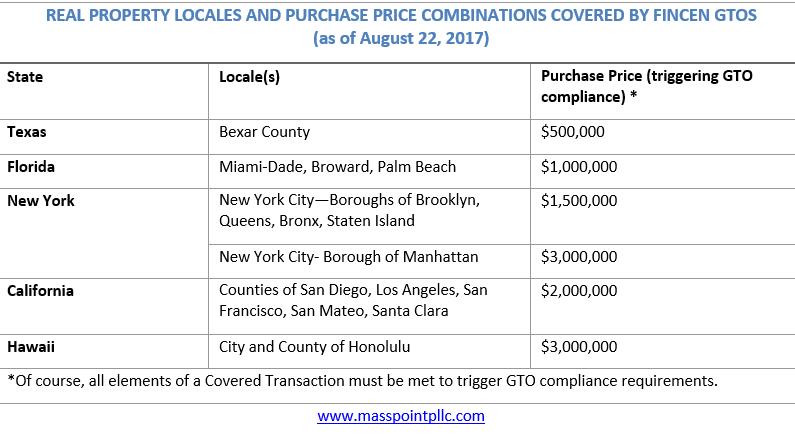 The August GTO covers additional locales—the City and County of Honolulu, Hawaii—bringing targeted geographic and purchase price combinations to the following six. U.S. Senators Raise National Security Concerns About Foreign Investment in U.S. Real Estate, May 2017. Congressional Hearing on Terrorism Financing Focused on Bank Secrecy Act Data Collection and Sharing and Effectiveness, April 2017. Proposals to Curb Foreign Investment in the United States Gaining Steam After the U.S. Election, November 2016. Proposed U.S. Rule Requires Banks to Collect Beneficial Ownership Information, November 2014. [ii] See, e.g., Jamie Smyth and George Parker, G-20 leaders back drive to unmask shell companies, Financial Times, Nov. 16, 2014. [iii] Customer Due Diligence Requirements for Financial Institutions; Final Rule, 81 Fed. Reg. 29,398 (May 11, 2016) (to be codified at 31 C.F.R. 1010, 1020, 1023, 1024, and 1026) (the “CDD Rule”). See also, Hdeel Abdelhady, Proposed U.S. Rule Requires Banks to Collect Beneficial Ownership Information, Butterworths Journal of International Banking and Financial Law, November 2014 (discussing elements of the proposed CDD rule that are consistent with the final rule). [iv] Commercial real estate has also garnered scrutiny, but not formally (yet) in the United States. [v] See, e.g., Ali Qassim, U.K. Register of Overseas Beneficial Owners Raises Concerns, Bloomberg BNA, April 18, 2017. [vi] Advisory at 2. The 30% figure was presented in FinCEN testimony before Congress in April 2017. See, e.g., MassPoint PLLC, Congressional Hearing on Terrorism Finance Probes Bank Secrecy Act Data Effectiveness, Lack of Beneficial Ownership Transparency, and Potential BSA and Patriot Act Amendments, infra note 9. [viii] FinCEN has more than once noted that “persons involved in real estate closings and settlements” are “financial institutions” under relevant law, but have not been regulated as such by FinCEN. This and other statements could merely be descriptive of FinCEN’s authority vis-à-vis the real estate industry, or such statements may telegraph FinCEN’s policy or regulatory thinking. Time will tell. See, e.g., Advisory at 1. [ix] MassPoint PLLC, Congressional Hearing on Terrorism Finance Probes Bank Secrecy Act Data Effectiveness, Lack of Beneficial Ownership Transparency, and Potential BSA and Patriot Act Amendments at 4, April 28, 2017. [x] Id. at 4. It is worth noting here that title insurance companies often provide real estate settlement services even when no lender’s or owner’s title insurance policy is purchased. Thus, a title insurance company may be involved in an all cash transaction that does not involve the issuance of a title insurance policy. That said, it is accurate (and obvious) that FinCEN’s GTOs are not comprehensive as to, inter alia, transactions and geography. However, there are many ways that the purpose and letter of GTOs can be thwarted—for example, an individual can effectively have the power to obtain beneficial ownership of an entity after a real estate purchase is completed (and reported to FinCEN), such as by holding convertible debt that, at the time of a reportable real estate transaction, has not been converted into equity. [xiii] Id. at II.B.2.ii and III.A.1.i. [xvii] Id. at II.B.1 (“Each FinCEN form filed pursuant to this Order must be: (i) completed in accordance with the terms of this Order and the FinCEN form 8300 instructions (when such terms conflict, the terms of this order apply).” (emphasis added).